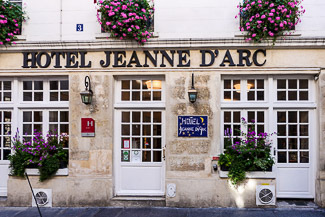 ABOVE: The three-star hotel Jeanne d'Arc is in the 4th arrondissement. From our Hotels in the Marais (4th arr.) article. Le Marais, which means "the marsh" or "the swamp" was once an area of vegetable farms. It was later settled by Eastern European Jews (whose descendants continue to attend synagogue and own businesses in the neighborhood), and the area just north of the Hôtel de Ville and east of the Centre Georges Pompidou is a mecca for gay Parisians and tourists. The Marais was declared an historically protected quarter in 1969, and today it's a lively area with apartments, art galleries, small shops, and a number of museums--among them, the Pompidou Center (which we've just mentioned), the Musée Carnavalet (the city's official history museum), the Picasso Museum, and Victor Hugo's House in the Place des Vosges. The neighborhood is also handy to the Place de la Bastille, where you'll find the city's modern opera house, movie theatres, cafés, a marina that's connected to the Seine by a lock, and streets that lead north into the Oberkampf restaurant and nightclub district. In terms of sightseeing, the 4th arrondissement is the most convenient area to stay in Le Marais, because it's close to the river and the No. 1 Métro line runs almost parallel to the Seine from Bastille to the Arc de Triomphe with stops at major Right Bank tourist attractions such as the Louvre and the Place de La Concorde. See Hotels in the Marais (4th arr) for hotel suggestions in all price ranges. The 3rd arrondissement is inland from the Seine (it's just north of the 4th), but it's worth considering if you find an apartment or hotel that appeals to you. Transportation: To reach this area from Charles de Gaulle Airport, Orly Airport, or the Eurostar terminal at Gare du Nord, take the RER "B" line to the Châtelet-Les Halles station and continue to your destination by Métro, by taxi, or on foot.